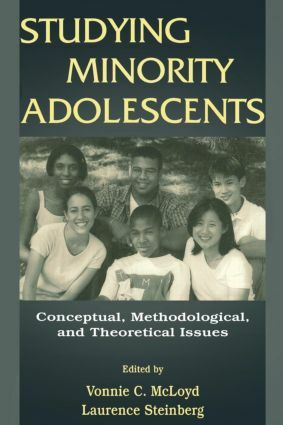 In the burgeoning research literature on adolescents, the relative paucity of work examining ethnic variations in developmental processes is a glaring gap, particularly because approximately one third of American young people now come from an ethnic minority background. A primary factor in this research imbalance has been the lack of training in methods and research instruments needed to properly study ethnically diverse populations. This book was developed in response to this need. Its chief objective is to present recent theoretical, conceptual, and methodological advances in the study of ethnicity and development during adolescence. The chapters address fundamental and enduring issues concerning the incorporation of ethnicity into research designs. Topics such as demographics, "ethnicity-friendly" research paradigms, and practical challenges that arise throughout the research cycle are addressed by scholars who have "been there" and learned how to successfully study the effects of race and ethnicity on developmental processes and outcomes. Established scholars and newcomers to research, working both in academic and applied settings with adolescents as their focus, will find this book a valuable resource. "Given the paucity of research on ethnic minority youth, and given demographics that suggest that minority populations will continue to grow, this volume is likely to become a staple in the libraries of researchers and policymakers alike." "The authors of this volume provide answers to these questions that will be valuable to a variety of academic fields, such as psychology, family studies, and ecomonics, and to those whose professional fields interwine with knowledge of ethnic minorities, such as social service agencies and policy personnel….McLoyd and Steinberg's edited book provides excellent backgound information for future discussions of the trends." Contents: Preface. Part I: The Imperative for Research on Minority Adolescents and Families. V.C. McLoyd, Changing Demographics in the American Population: Implications for Research On Minority Children and Adolescents. L. Allen, C. Mitchell, Racial and Ethnic Differences in Patterns of Problematic and Adaptive Development: An Epidemiological Review. J.T. Gibbs, High-Risk Behaviors in African-American Youth: Conceptual and Methodological Issues in Research. Part II: Advancing Our Understanding of the Influence of Race and Ethnicity in Development: Conceptual Models and Research Paradigms. J. Phinney, J. Landin, Research Paradigms for Studying Ethnic Minority Families Within and Across Groups. C.R. Cooper, J.F. Jackson, M. Azmita, E.M. Lopez, Multiple Selves, Multiple Worlds: Three Useful Strategies for Research With Ethnic Minority Youth on Identity, Relationships, and Opportunity Structures. A.J. Fuligni, Adolescents From Immigrant Families. Part III: Responding to Methodological Challenges in the Study of Ethnic Minority Adolescents and Families. Sampling: A.M. Cauce, K.D. Ryan, K. Grove, Children and Adolescents of Color, Where Are You? Participation, Selection, Recruitment, and Retention in Developmental Research. Assessment and Data Analytic Issues: N.G. Guerra, R. Jaegers, The Importance of Culture in the Assessment of Children and Youth. G.P. Knight, N.E. Hill, Measurement Equivalence in Research Involving Minority Adolescents. A. Doucette-Gates, J. Brooks-Gunn, P.L. Chase-Lansdale, The Role of Bias and Equivalence in the Study of Race, Class, and Ethnicity L.C. Wilson, D.R. Williams, Issues in the Quality of Data on Minority Groups. V.C. McLoyd, R. Ceballo, Conceptualizing and Assessing Economic Context: Issues in the Study of Race and Child Development. L. Steinberg, A.C. Fletcher, Data Analytic Strategies in Research on Ethnic Minority Youth. Part IV: Integration of Research and Provision of Services. O.A. Barbarin, Integrating Service and Research on African-American Youth and Families: Conceptual and Methodological Issues.